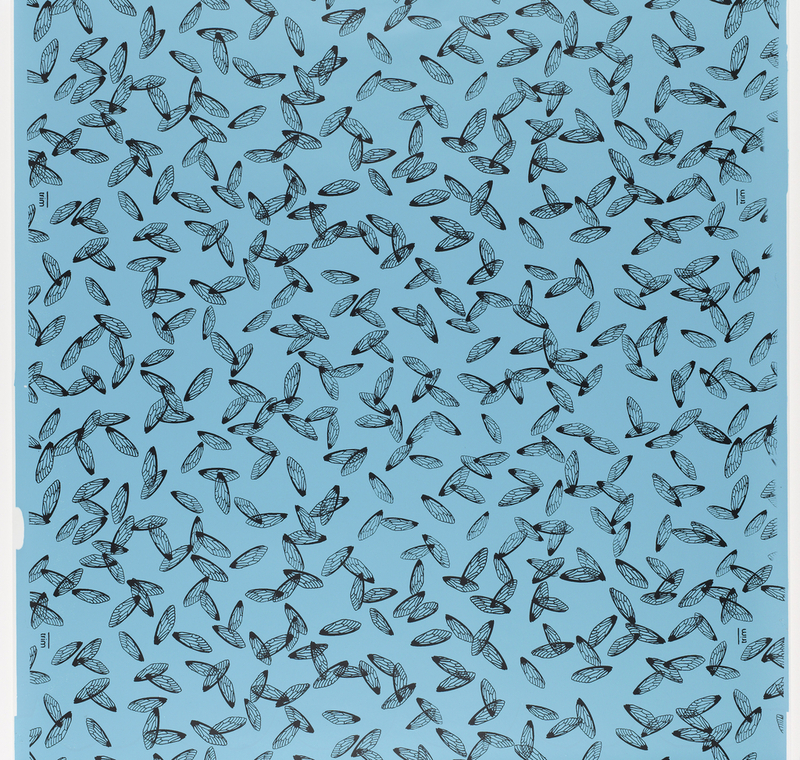 This all-over pattern of bug wings, possibly the common house fly, makes an unusual design for a wallpaper. Insects are actually a rather common motif on papers, usually representing nature, or possibly a butterfly symbolizing Psyche. And I know butterfly and moth wings have long been used to create beautiful iridescent accents on decorative objects but I can’t think of another use of bug wings being used to create a wallpaper pattern. These insect wings are delicately drawn and spread evenly across the surface of the design so there are no major voids or dense areas. Sarah Perry, along with fellow artist’s Jeff Colson and Robert Therrien, were approached for a private commission to design wallpapers for a mid-century modern house in 2006. The papers were never produced for commercial sale and this is the only sample of Perry’s wallpaper design in existence outside the original house installation. Perry is a sculptor who frequently works with commonplace and found objects, a theme which has carried over into her wallpaper design. Perry’s first major art pieces were large-scale gorillas fashioned out of rubber tire scraps found along the Los Angeles freeway. In 2001, she constructed a nine-foot-tall rocket ship using horse and cattle bones. While the majority of wallpapers in the Cooper Hewitt collection were mass produced for residential or commercial use, there are a few that were not intended for commercial sale. These include a group of papers produced for the Royal Pavilion at Brighton (1820s); papers designed by A. W. N. Pugin for the Houses of Parliament (ca. 1850); and Andy Warhol’s Cow (1966), which was created as an installation piece. Papers designed by artists and small studios are becoming more frequent and can offer a unique design not found in the mainstream market. The screen-printing of wallpapers begun in the 1930s, and of course digital printing today allow artists and small studios to print wallpaper in small runs for niche markets so their designs do not need to appeal to the mass market. Sidewall, Los Angeles, California, USA, 2006; Screen-printed on paper; Gift of Jerry and Eba Sohn, 2007-6-2.